A Church statement said the body was in "fair condition," particularly the hands, which Archbishop Domenico D'Ambrosio, who witnessed the exhumation in the southern Italian town where Pio died, said "looked like they had just undergone a manicure." 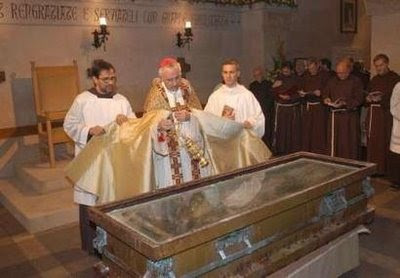 The body, which had been buried under marble in a crypt, was exhumed during a three-hour service that ended after midnight. A Catholic magazine once found that far more Italian Catholics prayed to Padre Pio than to any other icon of the faith, including the Virgin Mary or Jesus. Some 7 million people visit his tomb every year. There are some 3,000 "Padre Pio Prayer Groups" around the world, with a membership of around 3 million. The friar, born Francesco Forgione, died in 1968 aged 81. Among the stories that surround him is one that he wrestled with the devil in his monastery cell. 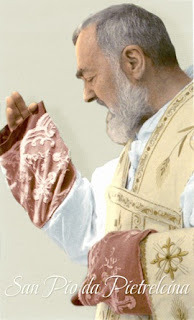 Padre Pio is also said to have predicted future events, to have been seen in two places at once, and to have been able to tell people their sins before they confessed them to him. Pope John Paul II made him a saint in 2002 at a ceremony that drew one of the biggest crowds ever to the Vatican after the Church said it had found evidence that the miraculous cure of a sick woman was due to the dead monk's intercession. But Padre Pio was dogged during his life and even after his death by accusations that he was a fraud. A new book last year suggested he was a self-harming man who may have used carbolic acid to create wounds in his hands mimicking those of Christ when he was nailed to the cross. Padre Pio's feast is observed on the 23 September anniversary of his death.